Of the one hundred and twenty-five species of Mullein that are native to the Old World, five have become naturalized ralized in the United States. 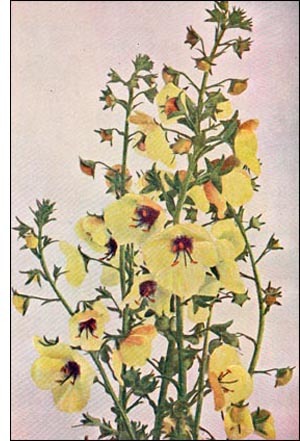 The Great Mullein, so familiar in dry, open fields, was originally christened by Pliny, and has since received over forty English names of a less classical origin and significance. The great mullein varies in height from two to seven feet. The stem is stout, very woolly, with branching hairs. The oblong, pale green, velvety leaves form a rosette on the ground or alternately clasp the stem. The flowers, which are about an inch in diameter, are clustered around a thick, dense spike, and have two long and three short stamens, so arranged as to materially assist the process of cross-fertilization, which is largely carried on by bees. It is interesting to note in connection with the thick, woolly covering of the plant that many vegetable forms are so protected when exposed to intense heat or cold. This is true of most Alpine and desert forms, and the value of such a protection to the mullein will be seen when it is remembered that the plants are always found in open, dry, stony fields, exposed to the fierce heat of the sun, and afforded no protection for the rosettes of year-old plants, which must survive the winter in order to send up the flower stalk the second spring. The Moth Mullein is a far more attractive and graceful plant than the form previously described. The specific name was derived from the idea that the plant would kill the cockroach (Blatta). It was supposed that moths would not go near the plant, and it was quite a general custom in New England to pack these plants or flowers with clothing or furs in order to keep out moths. The stamens are similar to those of the great mullein, except the filaments are tufted with violet hairs. The flowers are yellow or white, on long, loose racemes. The erect, slender stem is usually about two feet in height, and as a rule there are no leaves present at the flowering time.